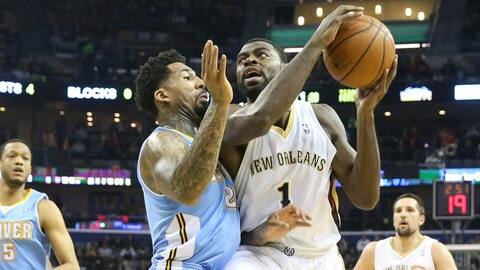 The New Orleans Pelicans exacted their revenge on the Denver Nuggets Friday, triumphing on their home court in front of a packed holiday house 105-89, recording their first victory of the season against a team with a winning record. The Pelicans outscored the Nuggets in all four quarters, out-rebounded the number two rebounding team in the league 53-42 and won the fast break battle 23-16. "It’s good to beat a team with a winning record," head coach Monty Williams said. "But I don’t look at it that way because I think it disrespects the teams that don’t have a winning record who are pretty good. When you are playing in the West you could have a quote, unquote losing record and still be competitive. I just want to win as many games as we can." Perhaps most impressively, the Pelicans triumphed definitively without starting shooting guard Eric Gordon or starting center Jason Smith, who are out with a hip contusion and a bruised right knee respectively. Ryan Anderson and Anthony Morrow filled in on the starting lineup with ease. Anderson posted a double double with 16 points and 10 rebounds. Morrow contributed 8 points, 1 blocked shot and 1 assist. Starting power forward Anthony Davis gave the home crowd a scare, going down in the first half, after painfully whacking his elbow on the court. He returned though in the second half to finish the game with 17 points, four blocked shots and seven rebounds. Reserve swingman Tyreke Evans continues to be a major force since returning from his third ankle sprain of the season. Friday, he finished with 19 points, 10 assists and seven rebounds. Evans entered the game as the NBA’s second-best bench scorer, averaging almost 15 points per game. "We owed them from Denver," Evans said. "They kicked our butts in rebounding and one of our main focus was to try to go down and help our bigs out, and I think we did a good job of that." The Nuggets took Round 1 of the 4-game series this season on December 15 in Denver by a score of 102-93. That was Denver’s last victory. Friday’s defeat marks the Nuggets fifth consecutive loss. Williams acknowledged before the game that it has taken him some time to figure out how to best use Evans, a complete player with the versatility to excel in several roles. Williams and the rest of the coaching staff considered moving Evans into the starting lineup, but ultimately decided he was more impact full off the bench. Evans played more than 32 minutes, second only behind Anderson’s 39:30. "He has the ability to create for other people,Williams said. "He and AD are getting some synergy in pick-and-roll situations or in transition." In Williams’ ideal world, he still wants to play both Anderson and Evans off the bench, but that will have to wait until Smith or Gordon can return. The Pelicans next play Saturday night in Houston against the Rockets. They return home to face the Portland Trailblazers Monday in the New Orleans Arena.